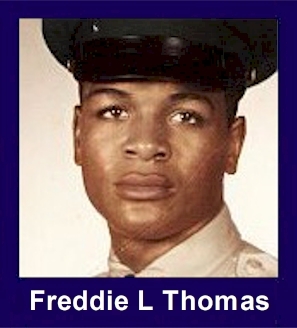 The 35th Infantry Regiment Association salutes our fallen brother, SSG Freddie Lee Thomas Jr., who died in the service of his country on November 9th, 1967 in Quang Nam Province, Vietnam. The cause of death was listed as Small Arms/AW. At the time of his death Freddie was 24 years of age. He was from Jacksonville, Florida. Freddie is honored on the Vietnam Veterans Memorial at Panel 29E, Line 63. The decorations earned by SSG Freddie Lee Thomas Jr. include: the Combat Infantryman Badge, the Purple Heart, the National Defense Service Medal, the Vietnam Service Medal, the Vietnam Campaign Medal and the Vietnam Cross of Gallantry with Palm Unit Citation. Funeral services for Army Sgt. Freddie L. Thomas Jr. will be held at 1 p.m. today in Jerusalem Baptist Church, South Jacksonville. Burial will be Wednesday in Barranca National Cemetery. Pennsacola. Hillman-Pratt Funeral Home is in charge. Sgt. Thomas died Nov. 9 from wounds received in combat in Vietnam. He was born in Jacksonville, was a graduate of Douglas Anderson High School class of 1961 and was a member of Wayman Chapel AME Church. Surviving are his widow, Mrs. Louise Thomas; two daughters, Vernita and Kimberly Thomas; his parents , Mr. and Mrs. Freddie Lee Thomas Sr., and a grandmother, Mrs. Cora Thorpe, all of Jacksonville. Thomas Funeral services for S. Sgt. Freddie L. Thomas Jr will be held Tuesday at 1 p.m. in Jerusalem Baptist Church. The funeral cortege will form at 2954 Sandlin St. S Sgt. Thomas died November 9 from wounds received while engaged in combat in Vietnam in the US Army. He was a graduate of Douglas Anderson High School, Class of 1961 and was a member of Wayman Chapel AME Church, Rev. G.W. Smith, Pastor. Survivors include his wife, Mrs. Louise Thomas, daughters, Vernita and Kimberly Thomas; parents Mr. and Mrs. Freddie Lee Thomas Sr.; Grandmother Mrs. Cora Thorpe, brother Kermit McCray; aunts, uncles, in-laws and other relatives. Interment will be in Barrancas National Cemetery, Pennsacola, Fla. Weds. At 1 p.m. Local arrangements in charge of Hillman-Pratt Funeral Home, Oscar I. Hillman, director.